Radhika Coomaraswamy, seniormost Sri Lankan official at the UN, is supposed to have warned Sri Lanka recently that it was under attack by various Non-Governmental Organizations. The story may be apocryphal, but the reason given has certainly emerged in various writings, namely that they wish to stop what happened in Sri Lanka being used as an example. Their fears are understandable. In the last couple of years Sri Lanka has turned on its head the previously dominant narrative about countries facing internal problems. In the process it has made a nonsense of the claim prevalent in what is termed the international community, namely that such countries, if they are small and weak, are failed states, needing to be rescued from failure by that very international community, a few countries that call the shots, and their accredited agents, the so-called humanitarian community that consumes in salaries and allowances and perks a high proportion of the funding that donors and taxpayers assume goes to the destitute. But before we proceed, let us lay down a few facts. What has Sri Lanka achieved in the last few years? To start with the unquestionable, it has destroyed a terrorist movement that has often been described as the most dangerous in the world, one that pioneered suicide bombing, and that has played a major role in developing networks of narco-terrorism. It has brought under the control of government wide areas of territory that were previously under the control of this terrorist movement. Despite the terrorist movement herding civilians to be used as a human shield, Sri Lanka succeeded in rescuing nearly 300,000 of these helpless victims of enforced displacement. Previously, it had continued to provide social services, including health and education, for all its citizens who had been in the areas controlled by the terrorists. Educational support meant free books and uniforms for students upto secondary level, salaries for teachers and funds for school maintenance, and the conduct of public examinations. It had provided free university education for all those from the area who qualified, though latterly the terrorists had kept such students behind forcibly and prevented them from attending the universities, including the ones in Jaffna and Batticaloa, with colleges in Vavuniya and Trincomalee respectively, that the state funds. 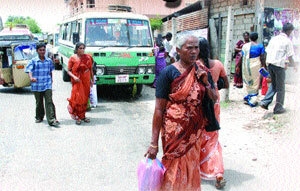 Sri Lanka had also provided food supplies throughout to the people in terrorist controlled areas, by ensuring regular convoys of food for sale, in addition to supervising the food supplied free by the UN for the displaced. After the war it managed to send back to their homes almost all the 300,000 within a year. In addition it has begun resettlement of another 100,000 or more who had left or been expelled by the terrorists in the preceding decades, including the Muslims whom the terrorists had ethnically cleansed in 1990. To do this it had to demine large areas of land, which involved buying expensive equipment and deploying several army teams, working together with much regional and some international support. It also restored basic infrastructure to the region, including schools so that these were able to start immediately children went back to their original areas of residence. Sri Lanka has also now released after basic rehabilitation nearly half the 11,000 or so former combatants, many of whom had been forced into military service by the terrorists, who had continued to recruit children forcibly right through the last couple of decades. And it has done all this while its economy has continued to grow, despite the loans it had to take not just to fight terrorism but also for demining and the infrastructure essential to provide decent returns for the displaced. These facts are unquestionable. They should also be considered in the light of the various allegations made earlier, beginning with the assertion that the LTTE could not be overcome militarily. Then it was alleged that conquering the LTTE would necessitate a bloodbath. After the war was over it was stated that we were determined not to resettle the displaced, and that we were instead going to colonize their areas of residence. Interestingly enough, these allegations were not made by Sri Lankans in Sri Lanka, except for those associated with the principal opposition party (or rather its current leadership, the alternative leader Sajith Premadasa having throughout been an honourable exception to this tendency) or by the one Tamil political party that was closely associated with the terrorists in their heyday, going to the extent of claiming that they were the sole representatives of the Tamils. On the contrary other Tamil political parties, which were being decimated by the terrorists in the years following the so-called Ceasefire Agreement, continued to work with the elected Sri Lankan government for a united Sri Lanka. Currently all minority political parties in Parliament, except for the party above mentioned – though it too has now managed to rid itself of terrorist associations – support the current government. Finally, given what Ms Coomaraswamy reported about the NGOs, which like to describe themselves as the International Community, let me note one recent example of how the world in general views Sri Lanka, as opposed to those who still wish to denigrate her. Earlier this month the Special Forces Commander of the Jaffna area was awarded the GUSI Peace Prize, which will be presented to him in Manila next month by the Philippine President. Given the problems the Philippines have faced, and the need to resolve them by eradicating terrorism whilst protecting and promoting the interests of the civilians amongst whom such terrorists function, they would do well to follow the Sri Lankan example – but then where would all the NGOs be, who have thrived for so long on the problems of the Philippines? If other countries followed the example of that General, who immediately after the war deployed his soldiers in peace building activities, including the restoration of places of religious worship for the displaced to return to, we would have quicker return to normality in conflict areas. As it is, we have to put up with endless reports in areas in which the West has taken command of the war against terrorism of denigration of the people amidst whom the struggle is conducted. Sometimes I fear that that is an inevitable product of the ‘othering’ on which, as Nirmal Verma so eloquently put it, the West has tended to construct identity, instead of adopting the inclusive approach that was our heritage and which we in Asia must continue to strive to uphold.